The coyote is a native North American species that is responsive, not invasive. Indeed they have expanded their range due to the extirpation of the wolf. Our coyotes’ genome includes about 25% wolf genes picked up from hybridization with wolves as coyotes expanded their range through Canada. After which the coyotes continued their range expansion to the Northeastern US. Eastern coyotes tend to be larger than western coyotes, probably as a result of these genes. The term “coywolves” has been coined for northeastern coyotes but this seems misleading since they are not currently hybridizing with wolves. They are coyotes with some wolf genes. People have hunted wolves and coyotes for centuries so both species are inherently afraid of humans. A decade of NBCS tracking data from local coyotes shows that habituated behavior in coyotes here results from people feeding them – effectively training them to lose their natural fear – not from wolf genes. Habituation occurs in western coyotes too. The decline of the New England cottontail (a rare species, not the common Eastern cottontail we see on lawns) is most likely due to the reduction of protective shrub cover and forage by hungry, overpopulated, deer. Loss of the critical shrub cover exposes the rare cottontails to numbers of predators, including coyotes, foxes, and several species of hawks and owls, as well as reducing available cottontail food. The distribution of the few remaining natural sub-populations of New England cottontail provides evidence that a dense shrub layer is key to their survival. The last NE Cottontails persist in dense briar thickets (the most protective of these composed, ironically, of exotic invasive multiflower rose). It is not just rabbits. Loss of the shrub layer to deer over-browsing reduces protection and forage for ground and shrub-nesting birds (like hermit thrushes and Bob White quail), and many other wildlife species. Our coyotes are much smaller than wolves and appear to be less effective deer predators. 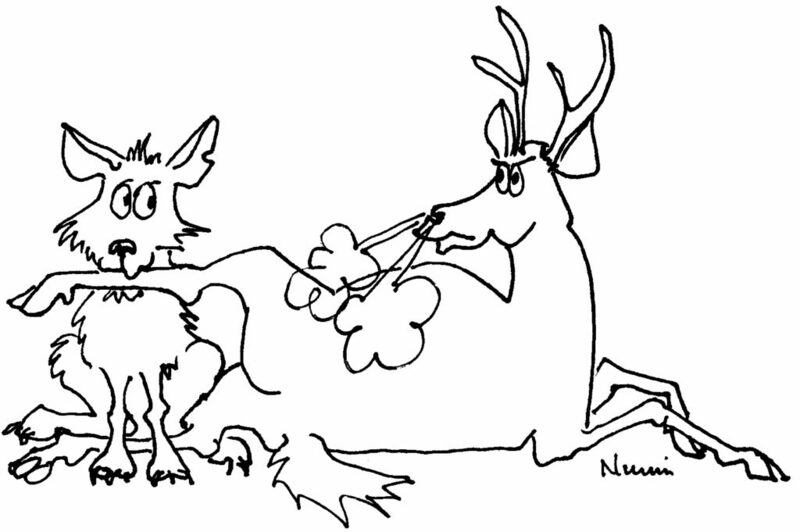 However, to the extent that coyotes do take deer, they are providing an important ecosystem service. 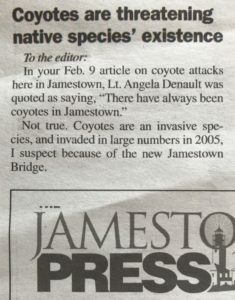 I would argue that deer are currently creating a greater threat to our wildlife species than coyotes. Deer over-browsing is destroying vital breeding, forage, and shelter habitats that countless species rely on. To recover and sustain native wildlife species diversity we need to develop solutions to reduce the deer population. Coyotes can’t do it on their own.